1 x 1PC Project 2010 Professional Digital Product License Key with installation media. 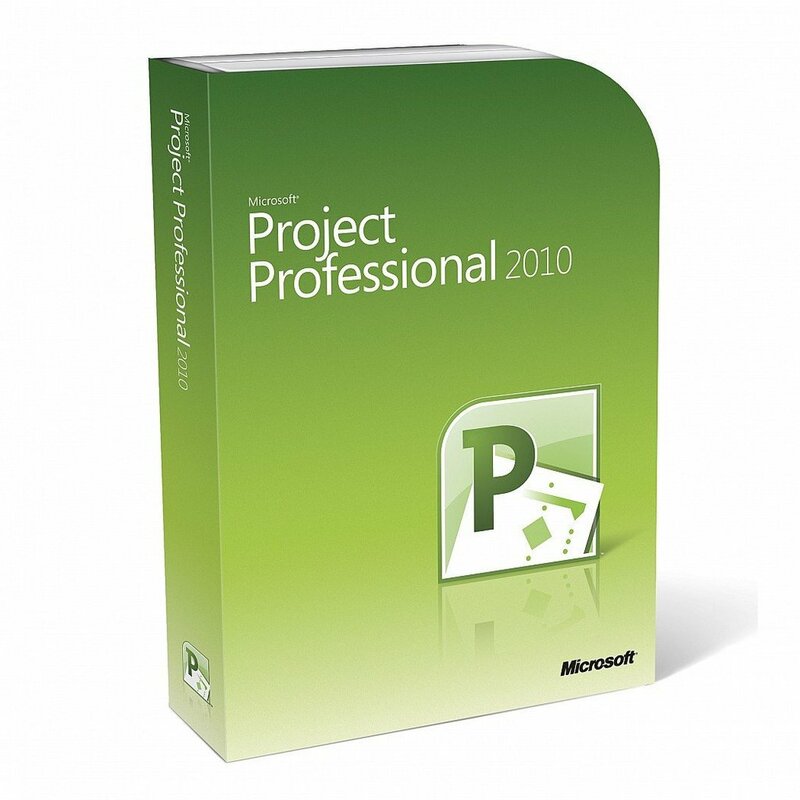 Project 2010 is available in two editions. Standard and Professional. When you find yourself managing multiple projects simultaenously , interrupted schedules, sharing resources, maintaining spreadsheet schedules become overwhelming. With its dynamic scheduling engine, resouce management tools, and support for smoother communication, Project can help you stay on track and stay efficient. Microsoft Project Professional allows all projects in your organisation to connect from a central enterprise-wide resource pool. This enables project managers to quickly see the availability of a resource before assigning that resource to any task. Project can help you quickly adjust your project schedule and resource assignments with its dynamic scheduling engine to handle timeliness. Project 2010 handles a date change and its effects seamlessly, accounting for all outcomes, deliverables, and project resource assignments so that you can quickly see the effect of each schedule shift. With Project 2010, you can instantly generate a visual report that uses a template that exports the data to a PivotDiagram for Microsoft Visio Professional. You can choose which fields that you want to highlight/export in the report, including custom fields that you have set up for your project, to present a clean, concise report for any meeting. Project has more than a shiny new interface, but that's not all - within it contains powerful new scheduling, task management, with many improvements that give you greater control over how you manage and present your projects and timekeeping. Project 2010 introduces several features to dramatically enhance how you see and work with your project onscreen. When you first start Project 2010 - The menus and toolbars have been replaced with the fully customizable ribbon, which helps you quickly find the commands that you need to complete a task to work more efficiently. Click on the File tab to access the Backstage feature a one-stop graphical destination for managing all your project files. The Backstage contains the same basic commands available on the File menu in earlier versions of Microsoft Project to open, save, and print project files and much much more. The Options command bar that was on the Tools menu has been moved into the Backstage. This command opens the Project Options dialog box, where you can enter, review, or change preferences controlling how Microsoft Project works and appears. One of the most commonly used commands can now be found with one simple right-click to access item view, such as bar, table cell, or chart, a mini-toolbar with a list of commonly used commands is displayed. When you're in a hurry, this is one way of using project that will pay you back in time saved. New viewing features have also been added to help you understand with greater clarity how your team is performing and where they are overallocated. Project can also help you and others in your organization see the big picture (and potentially major resource problems) with the Timeline view. Project Professional 2010 users now have the team planner, a resource scheduling view that lets you interact with your schedule in a way that hasn't been possible before in earlier versions of Project. With the Team Planner view you can see at a glance what your team members are working on and move tasks from one person to another. You can also view and assign unassigned work, view overallocations, and see task names as well as resource names — all in one efficient view. Managing your task and resources has never been so easy. For example, if a resource is overallocated, all you need to do is drag a task from one resource to another, and the overallocation disappears. 1 A task that is behind schedule. This task could be dragged to Tom or Cheryl, who aren't doing any work. 2 A task that is on schedule. 3 Tasks that are currently unassigned. These could be dragged to Tom or Cheryl, who aren't doing any work. Project 2010 includes a timeline view that is automatically displayed above other views, showing a concise overview of the entire schedule. You can add tasks to the timeline and even print it for an attractive summary report of the entire project. 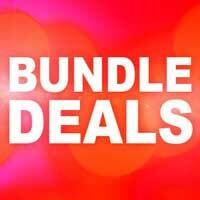 Or you can paste it into an e-mail for an instant report with no fuss. Manipulating views has often been challenging in Project. No longer. Take a look at the new ways you can orchestrate how your project is presented and controlled. Adding new columns to Project is greatly simplified. Simply click the Add New Column heading at the right end of the sheet portion of a view, and type or select the name of a column. An existing column can also be quickly renamed by clicking on its title and typing a different column name. Customizing a column has never been so easy. Project 2010 lets you quickly zoom the timephased part of a view using a zoom slider in the status bar. Simply move the slider to the right to move zoom in (show shorter time intervals, such as days or hours) on your schedule and to the left to zoom out (show longer intervals, such as weeks or months). The zoom slider works in the Gantt Chart, network diagram, and calendar views, as well as in all graph views. Project 2010 has several scheduling enhancements to improve your control over your schedule. You can also create initial task lists in Microsoft Excel or Word and paste them into Project without having to reformat them. 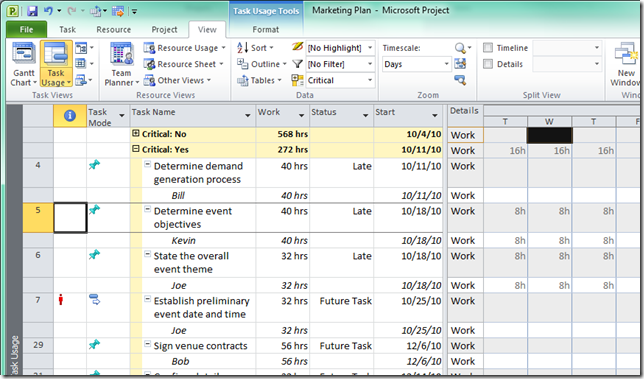 Project 2010 introduces a major shift in how projects are scheduled. Changes to factors such as task dependencies and the project calendar no longer automatically adjust task dates when a task is manually scheduled. You can place a manually scheduled task placed anywhere in your schedule, and Project won't move it. Project managers who are accustomed to automatic scheduling with past versions of Project can turn the new manually scheduling feature off for specific tasks or the entire project. Some projects, especially complicated ones, may require Project's powerful scheduling engine to take care of scheduling for you. With Microsoft Project Professional 2010, you can make tasks inactive and still retain them in the project. Inactive tasks often have critical information (such as actuals and cost information) that can be valuable for archival purposes. Project managers are no longer restricted to creating subtasks and then rolling them up into summary tasks. For Project 2010, you can create summary tasks first, and they can have dates that don't exactly match the roll-up dates of the subtasks. At the beginning of the planning phase, project managers may only have some high-level information on key deliverables and major milestones of their projects. Using Project, you can divide projects into high-level phases based on the overall timeline and budget. This means that dates for individual work items do not necessarily need to line up exactly with dates for the high-level phases. The compare versions feature in Project 2010 now includes Gantt bars and graphical images to help you more clearly see how one version of a project differs from another version. Projects don't exist well in isolation from other people in your organization. Project has improved ways in which you can share project information. Project Professional 2010 users can export project files to a SharePoint list, which provides a quick and simple way for a project manager to share status or create reports that can be viewed across the organization. You don't need Project Web App to sync with a SharePoint list. With two clicks of the mouse, you can generate an instant report and copy it to most Office programs. You can create files in Project 2007 or earlier and then open and edit them in Project 2010 in a reduced-functionality mode. In addition, you can create files in Project 2010 and then convert them to the Project 2007 or Project 2000-2003 file formats. Either way, you don't need a converter! 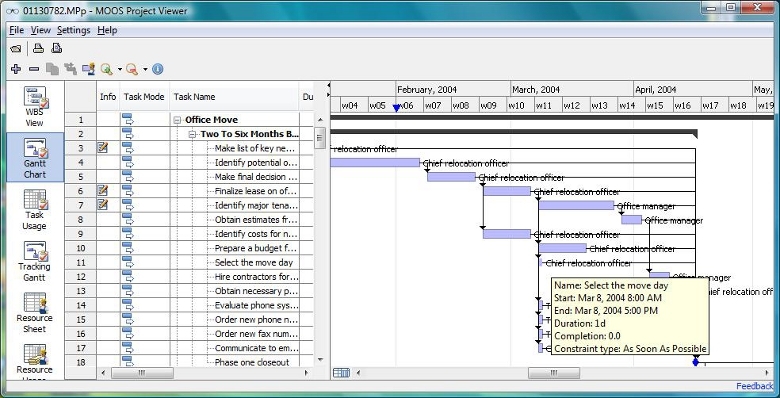 Note Features unique to Project 2010, such as manually-scheduled tasks and top-down summary tasks, may not appear as expected when viewed with earlier versions of Project.